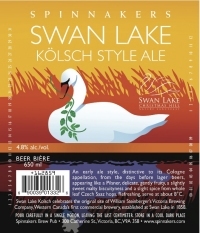 VICTORIA, BC – Spinnakers Brewpub has added two beers to their bottled line-up, Spinnakers Original Pale Ale and Swan Lake Kölsch Style Ale. This lightly hopped, straw coloured, effervescent Pale Ale with a delicate hop aroma and a balanced, slightly sweet finish. 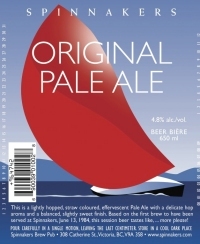 Based on the first brew to have been served at Spinnakers on June 13, 1984. This session beer tastes like… more please! Made as a fundraiser for Swan Lake Christmas Hill Nature Sanctuary’s Bridges to Nature Campaign. Ten percent of proceeds from all pints and bottles of Kolsch will go towards this great initiative. This ale is distinctive to Cologne from the days before lagers, appearing like a Pilsner, delicate and refreshing, gently fruity, with a little sweet biscuityness. Both beers are available at the Brewpub, and in select government and private liquor stores in BC.